Strong performers, the Etymotic ER4 are reference-grade in-ears for folks who want the best sound quality on the planet. That said, casual listeners and budding earbud enthusiasts likely won't like the steep price, deep in-ear design and constant sibilance with less-than-pristine audio sources. Critical listening in-ear headphones are designed with a very clear purpose in mind, to provide crystal-clear audio in the smallest package possible. So who better to create the next cutting-edge version of the form factor than the company who produced the first noise-isolating high-fidelity in-ear earphone? The Etymotic ER4 Earphones are the next-generation of venerated in-ears created by the originators of the form factor. They come in two types of tuning - the ER4SR (Studio Reference) and ER4XR (Extended Response) - but both provide insanely clear audio in all parts of the spectrum. If you’re a critical listener - the kind who likes to sit back and hear every minute detail in their music - there’s no better pair of in-ears out there. But, if you plan on leaving your home with your headphones, have a less-than-pristine audio archive or don’t fancy yourself much of an audiophile, there are other earphones out there that sound nearly as good, feel more comfortable and cost much less. 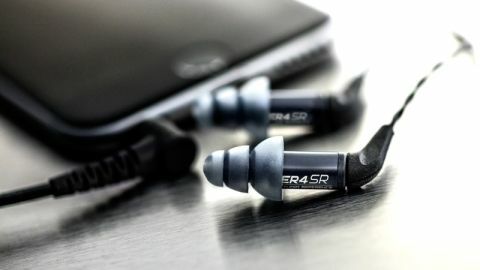 The ER4 are designed to be in-ear, like, deep in-ear. To aid with its fit, Etymotic includes both foam and flange tips in multiple sizes - and getting the right fit isn’t terribly hard. That being said, having something sitting so deep in the ear canal can feel a little strange, especially if you’re coming from earbuds like AirPods or Apple’s pack-in EarPods - though, admittedly, that would be quite the leap in sound quality. Because they sit in such a strange way, it’s not the kind of earphone we’d want to walk around with downtown. Unfortunately, without something like a wing-tip to hold them in place, they jostle around just a bit too much. Taking into consideration that these are extremely high-grade in-ears, it’s no wonder that you won’t find a built-in mic or playback controls anywhere. That might irk some folks looking to have easy access to control their music but, considering that these are critical listening in-ears, it’s not something we can hold against them. They say the best pairs of headphones are like a still pond of water - they reflect exactly what they see. The Etymotic ER4 absolutely reflects the source … sometimes a little too clearly. What we mean to say there is that while the ER4 is crystal-clear sounding, it can often exacerbate small flaws in a recording. But let’s focus on the good for a second. In terms of providing a true neutral sound - the kind that you’d want to have with you in a recording booth or while editing your band’s next album, these are the in-ears to wear. There’s no beefy bass distortion or tonal v-shape that has dominated the headphone industry for the last few years, and the soundstage is absolutely massive. Etymotics is so sure they’ve hit true neutral with these headphones, that the company will even include a frequency range chart in every package just to prove that how clean the sound is all the way through. If nothing else, Etymotic offers real, true data that other manufacturers would be too shy to include with their in-ears. The down-side to all this is that the sound can be jarring - especially if you’re the kind of person who doesn’t habitually download FLAC or ALAC instead of more-convenient MP3s. While bass is pleasant but powerful the upper mids and highs become sharp, sibilant and generally dominate the sound when listening to a less than pristine source like Spotify. It was our experience that, unless we listened at a low volume, the pops and hisses from vocals and snares actually bite the eardrums, making for a super uncomfortable listening session. Should you want something a bit heavier in the low-end, you can always opt for the XR version of the headphones, which put more emphasis on bass and sub-bass frequencies. On top of all that, thanks to the rock-solid build, you’ll never hear cable noise or nary a hiss from the in-ears, which can make for comfortable longer listening sessions with the right music. If you’re a devout audiophile - the kind who doesn’t go anywhere without a portable DAC - you’ll find a lot to love about the $349 (£359, AU$599) Etymotic ER4SR and ER4XR. They offer crisp, clean and clear playback when paired with pristine audio files and only sound better the more high-end audio gear you hook up to it. That being said, if you’re not the kind of person to discuss the correlation between sensitivity and impedance in a pair of headphones or are price sensitive, you’re best served looking elsewhere.